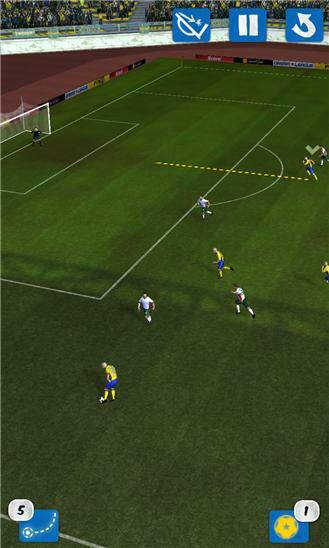 Published by First Touch Games Ltd.
Have you got what it takes to score the match winning goal? Recreate your favourite goals in this unique football based puzzle game. Football fan or not, this app will keep you entertained for hours! Score! now features official goal packs from Chelsea FC, Juventus, Liverpool FC and Manchester City FC! Score! 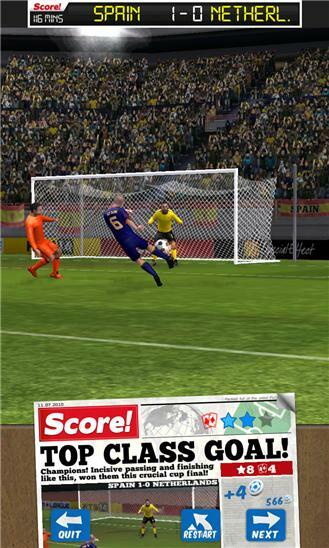 World Goals is truly international in scope and comes packed with thrilling gameplay. Recreate over 1,000 goals from all over the world, including domestic leagues, European cups and International tournaments. Amateur, Pro & Bonus modes will keep you endlessly engrossed. ***************************************** SUPER INTUITIVE GAMEPLAY Score! World Goals features a huge range of challenges to tax the most skilled football player. Players can pass, cross and shoot using the intuitive swipe mechanics whilst controls enable sensational top-corner shots. Smart defensive artificial intelligence will react to shots and passes, making you feel like you’re part of the action. AMAZING GRAPHICS AND SOUND Score! World Goals features an ultra-realistic graphics engine which combines with retina displays to make an even more eye-popping, console-like experience than ever seen before. Over 500 motion-captured animations guarantee unparalleled levels of authenticity, whilst captivating audio and authentic commentary put you right in the heart of the action. A STREAM OF NEW AND UPDATED CONTENT Score! World Goals will stay fresh and exciting with new levels being updated regularly. There’s also a Goal of the Day competition giving you reason to come back each and every day! ***************************************** Exclusive soundtrack provided by Dance à la Plage. We hope you enjoy playing Score! this title wouldn’t be possible without valued fan feedback. Follow us on Facebook and Twitter and let us know what you think. This game requires an Internet connection to download initial content. PLEASE NOTE: This game is free to play, but additional content and in-game items may be purchased for real money. Credits can be earned during gameplay, but can also be bought in packs ranging from $1.99 - $45.99/£1.49 - £27.99. VISIT US: firsttouchgames.com LIKE US: facebook.com/scoreapp FOLLOW US: @firsttouchgames WATCH US: youtube.com/firsttouchgames Version 2.71 * Bug Fixes Version 2.70 * NEW! Official 13/14 Goal Packs from Chelsea FC & Juventus! * Bug Fixes Version 2.60 * NEW! Official 13/14 Goal Packs from Liverpool FC & Manchester City FC! * Bug Fixes Version 2.51 * Bug Fixes Thanks everyone for your support, please keep the reviews coming!